Sweater by Maison About, swimshorts by Maison About, Panama hat by Artesano, sunglasses by Komono, bracelet by La Hoyde. So, actually this is the first look I’m doing after a 2 week hiatus, I think a few of you already know I have spent a week in Mexico, I did something with GQ and Vogue, can’t wait to show it to you guys. it’s really been a couple of crazy weeks… so, this banana sweater by Maison About is the perfect piece to represent what’s been going on. Shorts are by Maison About also, both made in Italy. 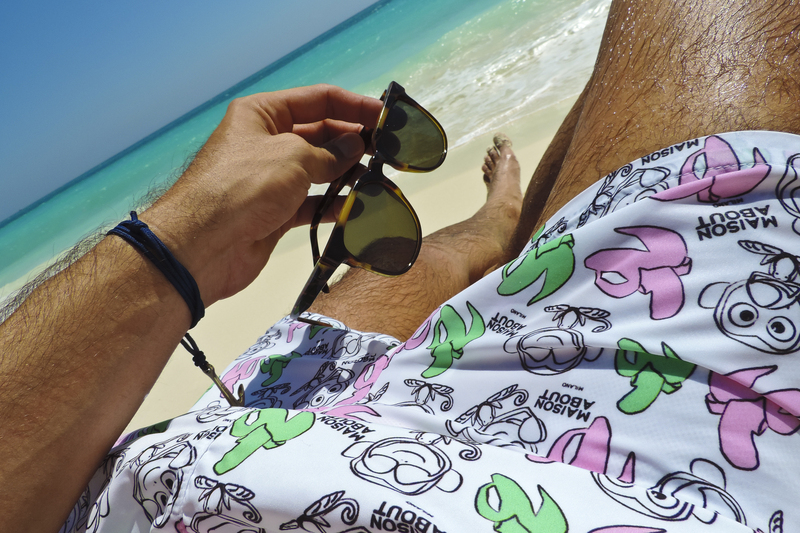 Shorts have this monkey print that kinda ties the whole banana outfit together *insert monkey emojis here*. Both pieces have a print but since the background is white is not so hard on the eye and looks relaxed and comfy, perfect for a lazy sunday. The Panama hat by Artesano is my favorite piece, I love my hats, i think they had some sophistication to any look, doesn’t matter what you are wearing, you can get yours visiting www.artesano.net , if you need advice just send me a message and I will gladly help you choose one. The sunglasses are Komono, I’m a sucker for tortoise, you all know that, I have a couple of pairs… but when pairing this outfit this pair jumped out. The anchor bracelet is from La Hoyde.